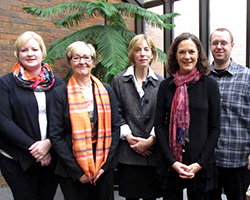 Members of the Northwoods team, from left to right are: Amanda Ostrowski, Chris Dobbe, Joan Theurer, Mary Hilliker and Jonathan Schmunk. Eighteen local health departments and their governing boards along with one tribal health program will explore cross jurisdictional sharing (CJS) options and develop common CJS tools and approaches for the participants’ future use. The project team will prepare an inventory of current capacity in each of the departments using the Public Health Accreditation Board (PHAB) self-assessment tool, analyze different CJS models for their potential use in the region, and identify service or function opportunities that could be addressed through CJS arrangements. The $124,610 grant supports the exploration and development of CJS sharing mechanisms involving 17 single-county and one bi-county health departments along with one tribal health clinic serving more than 1.1 million people across 18 counties. Watch this video of Christine Dobbe, project team lead and program coordinator of Marathon County Health Department, recorded during the first Shared Services Learning Community meeting in Kansas City. View this video from a webinar, during which the SSLC provided updates on their projects.